On Tuesday, the door of my institution, Kingston University, was darkened by John Pilger, a virulent denier of the crimes of Slobodan Milosevic’s Serbian regime against the Kosovo Albanians, who had been invited to speak. Pilger is someone who claims that no mass graves of Albanian victims of Milosevic’s regime have ever been found; he puts the term ‘mass graves’ in quote marks when referring to Kosovo. He even cites Milosevic supporter Neil Clark in support of his position. Pilger’s claim that no mass graves have ever been found in Kosovo is, of course, false. Untrue. In conflict with the facts. Contradicted by the evidence. A lie refuted by Amnesty International, among others. I challenged Pilger on his denial, in front of the audience of academics, students and others that he was addressing. I told him that I taught a course on the history and politics of mass murder here at Kingston University; that I had been studying the former Yugoslavia for many years; and that those, such as himself, who denied that Serb forces had been guilty of mass murder and genocide had been proven wrong. So as not to appear rude and lower the tone of the discussion, I did not accuse him of anything worse than having been wrong. Rather than attempt to defend his record, Pilger tried to play the numbers game with me (people like Pilger are under the impression that if the total number of victims in a campaign of mass murder turns out to be lower than some of the earlier estimates, it vindicates the deniers and the apologists). He asked me what I thought the death-toll in the Kosovo conflict was. I replied that it was about ten thousand (1). He then countered that no, the number of bodies found, including both civilians and combatants and members of all ethnic groups was ‘only’ four thousand, according to members of forensic teams working in Kosovo. This, it should be pointed out, is something of an upward revision for Pilger, who as recently as a year and a half ago was claiming that the total death-toll in Kosovo was ‘only’ 2,788, and that therefore the justification for the NATO operation against Serbia was an ‘invention’. I reminded Pilger that the Milosevic regime had systematically concealed and destroyed the bodies of its Kosovo Albanian victims; that more mass graves were being discovered as time went by; and that the body count was therefore likely to rise. He did not appear to have a counter-argument; his only response was to tell me ‘you clearly have an agenda’ and ‘you shouldn’t be teaching here’. Which, given that I was teaching at the invitation of, and in conjunction with, senior members of the same faculty and university as those who had invited him to speak, was something of an insult to his hosts. He then tried to shift the discussion away from the topic of the body-count (that he had himself introduced) and to claim that ‘the NATO war was to destroy the state called Yugoslavia’. I told him that was ‘nonsense’, and he decided that this was the time to move on to the next question. After the meeting and in the following days, several Kingston students and staff members approached me to tell me how shocked they had been at his reaction to my question and his inability to address it. Unknown to either myself or Pilger, a forensic expert who had worked on-site in Kosovo examining the bodies was also present in the audience. After the meeting, she approached him, told him who she was, challenged his version of events and asked him to tell her who the alleged forensic experts he had cited were, because they were probably people she knew personally. Pilger’s response was ‘I have to go now’. Although when I passed him in the entrance to the auditorium, he was talking to someone else and did not appear in any great hurry to leave. As I noted above, deniers such as Pilger are under the impression that if they can ‘win’ the numbers game – if the death-toll in Kosovo turns out ‘only’ to have been four thousand rather than ten thousand, for example – then they believe it will prove their case that genocide did not occur, the assumption presumably being that four thousand deaths are ‘too small’ to count as genocide. Pilger is an Australian, and it is interesting to note what the implications of his line of reasoning are for our understanding of one of the most prominent cases of total genocide in human history: the genocide of the native Tasmanians in his homeland, Australia. The native population of Tasmania was perhaps 5,000 at the start of the nineteenth century, possibly fewer (2). This population was totally eradicated over the course of several decades, largely through diseases and the destruction of its society by the European settlers, with a smaller number directly murdered and only some mixed-race individuals surviving. If one were to accept Pilger’s figures of 4,000 dead in the Kosovo conflict, this puts Milosevic’s killing of Kosovo Albanians on a scale very similar to that of the British and Australian destruction of the native Tasmanians, with a roughly equivalent death-toll, though accomplished in a matter of months rather than decades (NB the attempt by Pilger and others to claim that some of the Albanian dead in Kosovo were ‘combatants’ and therefore not proper victims of genocide could equally be made in relation to some of the native Tasmanians killed by the British and Australians, though it is questionable how much meaning the civilian/combatant distinction has in cases of genocide – one need only think of the Jewish fighters in the Warsaw Ghetto Uprising, for example – or indeed what ‘combat’ really means when groups with vastly superior technology, fire-power and resources, such as the Serb forces in Kosovo or the British and Australians in Tasmania, wage campaigns of destruction against civilian populations defended by poorly armed guerrillas). And, of course, Milosevic’s campaign of mass murder in Kosovo, unlike the British-Australian destruction of the native Tasmanians, was halted by outside intervention and was therefore unable to fulfil the intentions of its perpetrators. Australian deniers of the Tasmanian Genocide use many of the same techniques that Pilger does in relation to Kosovo, above all attempting to revise downward the death-toll of massacres, or to claim that they were ‘fabricated’ altogether. 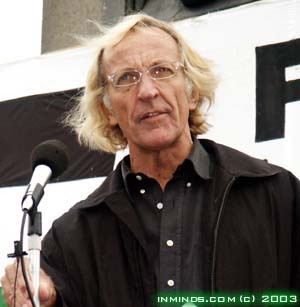 Pilger’s position on Kosovo mirrors and reinforces that of the deniers of the Tasmanian Genocide. In reality, genocide is not a matter of numbers. For more on Pilger’s denial, see Martin Shaw. 1) a scientific study by Paul B. Spiegel and Peter Salama of the Centre for Disease Control, ‘War and mortality in Kosovo, 1998-99’, published in the Lancet on 14 July 2000, estimated 18,800 total deaths in Kosovo in this period, of which 12,000 from war-related trauma; a second scientific study by a team of experts led by Patrick Ball, dated 2 January 2002 and submitted by the prosecutor to the trial chamber of the International Criminal Tribunal of the former Yugoslavia on 15 February 2002 estimates that 10,356 Kosovo Albanians were killed. See also here.